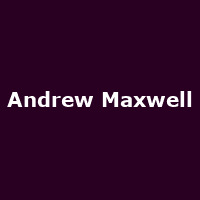 Andrew Maxwell is an Irish stand-up comedian and host of Maxwell's Fullmooners. He has previously appeared at Secret Policeman's Ball and Edinburgh Fringe, as TV's "Mock The Week", "8 Out of 10 Cats" and his own "Conspiracy Roadtrip", amongst others. Shows include: "Supernatural", "The Lamp", "The Lights Are On", "Yo Contraire!" and "Showtime".